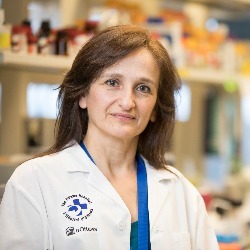 Catherine Tsilfidis is a senior scientist in the Regenerative Medicine Program of the Ottawa Hospital Research Institute, and an Associate Professor in the Departments of Ophthalmology and Cellular and Molecular Medicine at the University of Ottawa. She has an active research program that is funded by CIHR, the Foundation Fighting Blindness and the Krembil Foundation, and she currently holds the Don and Joy Maclaren Chair in Vision Research. Her research is aimed at developing a gene therapy strategy that blocks apoptosis and slows down retinal disease progression. She has applied this approach to the treatment of animal models of retinal disease. Her laboratory is currently optimizing gene therapy parameters for application to human disease. Dr. Tsilfidis is also the Director of the Office of Equity, Diversity and Gender Issues in the Faculty of Medicine at the University of Ottawa. She organizes and delivers workshops to medical students, residents, graduate students and faculty on Harassment and Intimidation and Respect in the Workplace. Dr. Tsilfidis is passionate about promoting the advancement of women in science and is currently helping to create a mentoring program for female post-doctoral fellows in the basic sciences. Wassmer SJ, Rafat M, Fong WG, Baker AN, Tsilfidis C (2013). Chitosan Microparticles for Delivery of Proteins to the Retina. Acta Biomaterialia 9(8):7855-64. Zadro-Lamoureux, L.A., D.N. Zacks, A.N. Baker, Q.-D. Zheng, W.W. Hauswirth, and C. Tsilfidis (2009). XIAP effects on retinal detachment-induced photoreceptor apoptosis. Invest. Ophthal. Vis. Sci. 50(3):1448-53. Leonard, K.C., D. Petrin, S. G. Coupland, A. N. Baker, B. C. Leonard, W. W. Hauswirth, R. G. Korneluk and C. Tsilfidis (2007). XIAP Protection of Photoreceptors in Animal Models of Retinitis Pigmentosa. PLoS ONE Mar 21; 2 (3):e314. Renwick, J., M. A. Narang, S.G. Coupland, J.Y. Xuan, A.N. Baker, J. Brousseau, D. Petrin, R. Munger, B. Leonard, W.W. Hauswirth, R.G. Korneluk and C. Tsilfidis (2006). XIAP-mediated neuroprotection in retinal ischemia. Gene Therapy 13(4):339-47.